The densification process involves the consolidation of loose or bulky materials through the application of thermal and pressure processes. Ajax TOCCO designs and manufactures custom systems for the controlled atmosphere densification of many advanced materials in a variety of applications. The company specializes in high temperature applications involving induction susceptor heating and process gas monitoring. The process of filling the voids of a sintered or unsintered compact or preform, such as graphite or tungsten, with a metal or alloy of lower melting temperature. The infiltration process is often accomplished within a vacuum or controlled atmosphere using an induction thermal technology. Ajax TOCCO designs and manufactures custom infusion and infiltration systems for a variety of applications. 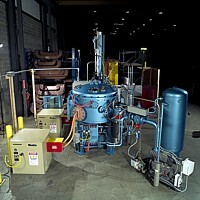 The company specializes in high temperature applications involving induction susceptor heating or melting technologies.